A nice kings crown compote with the ruby flashed band. Clear thumbprint pattern. Measures 5 3/8" tall and is in excellent condition. No damages, and the red flash is nice and bright all over. 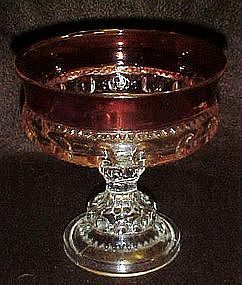 Made by Tiffin or Indiana glass. Co.